Private 45872 Frederick George Coburn, 8th Battalion, Royal Berkshire Regiment. Frederick Coburn is remembered on two memorials in Newbury and Speen. His mother, Fanny, was residing at 9 Marsh Street (off Northbrook Street) in Newbury when the CWGC records were compiled. However, Frederick was not a native of the town and was born in Islington, London, in early 1900, the first child of Frederick Coburn and Fanny (née Lockey), who had married in Newbury in 1899. By 1911 young Frederick was living with his paternal grandfather, Henry George Coburn, and his family in Speen. Henry was a butcher and publican and was at this date the landlord of the Five Bells in Woodspeen (Bell Mount). Frederick’s parents remained in Islington with their four youngest children while Frederick’s eldest sibling, Elsie, was with her maternal grandfather, George Lockey, on the Isle of Wight. It appears that Frederick’s parents were struggling to maintain their whole family. Frederick’s military career was not long or glorious; he must have volunteered or been conscripted almost as soon as he turned 18. After a few months training he was sent to France as a reinforcement for the 8th Battalion of the Royal Berkshire Regiment. On the 5th August 1918 he reached Mericourt (between Amiens and Albert) en route for the Battalion as part of a 176 strong draft of men. At the station at Mericourt a shell exploded killing or wounding 56 men before they even reached their frontline unit. Frederick was one of 21 men who died in Mericourt and were buried together in an extension to the local cemetery. The 8th Battalion’s war diary records the incident: A draft of 120 men arrived on the 7th inst; this draft should have consisted of 176 men but on the way up to join the Battalion 56 men became casualties, through the explosion of a shell at Mericourt Station on the 5th inst. It is possible that the shell went off while Frederick and his companions were helping tranship a consignment of shells from the train to the lorries/waggons that would take them onward to the artillery positions. Mr and Mrs Coburn, of Marsh Street, Newbury, have sustained bereavement by the death of their soldier son, Private Frederick George Coburn, of the Royal Berks, who had only landed in France eleven days before being killed by the accidental explosion of a shell. A letter of sympathy, and description of the sad occurrence has been received from Captain Bell, showing that the fatality was purely accidental. A letter of sympathy has also been received by the parents from the King and Queen, and from the officer in command, who sent the official news of the death. The young soldier was a great favourite with his grandparents, Mr and Mrs Coburn, of Woodspeen, who have now a son at the Western front and another home wounded. Unfortunately the letter does little to shed further light on the circumstances of Frederick's death. Frederick's grave is at Mericourt-l'Abbe Communal Cemetery Extension, grave number II. H. 21. 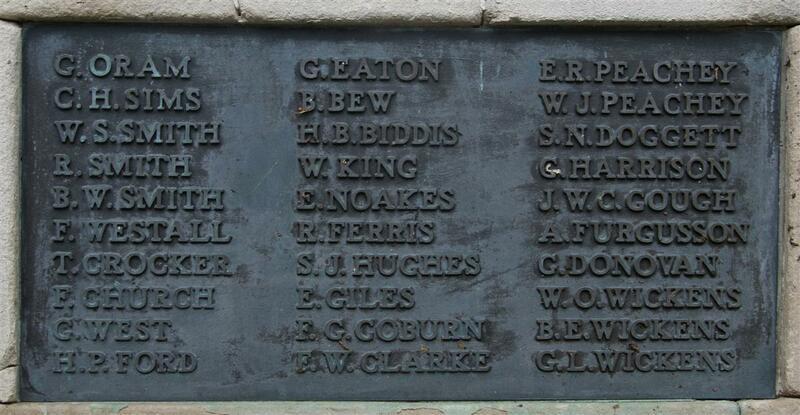 Locally he is remembered on Panel 8 of the Newbury Town War Memorial and also on the Speen War Memorial.